If you are looking for Raspberry Scone Recipes to make with fresh or with frozen raspberries, you have come to the right place! Here (below) are links to a Raspberry Scone Recipe Collection including plain, basic raspberry scones, and raspberry scones including chocolate, maple, and more. Be sure to check out the ❤ heart-shaped, very easy, baking powder biscuit recipe too! ... perfect for your valentine, a romantic dinner, or just to surprise the family you love! 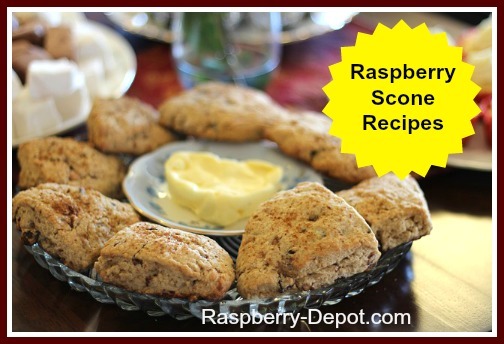 What exactly is a Raspberry Scone Recipe? Wikipedia defines a scone as "a small British quick bread (or cake if the recipe includes sugar) of Scottish origin. Scones are especially popular in the United Kingdom, Canada, Australia, New Zealand, Ireland, and the United States, but are eaten in many other countries. They are usually made of wheat, barley or oatmeal, with baking powder as a leavening agent." Scones can be made in many different shapes including round, triangle like quadrants, or squares. Traditionally these breads were made with currants, but they are now made with many different fruits and flavours.